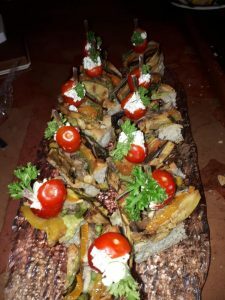 Focaccia bread topped with Guacam ole, Grilled Vegetable Pate, Herb’ed Goat Cheese Stuffed Cherry Tomato and served with Chimmichuri sauce. So good, named for a friend of Dianna’s whom she works with, enjoy. Preheat char-grill or barbecue plate on medium. Line a 20 x 10cm loaf pan or terrine mold with plastic wrap, allowing edges to overhang. Place all vegetables in a bowl. Add olive oil, and season to taste. Toss well. Char-grill capsicums until skin is black and blistered and the flesh is soft. Cover and cool, then peel away skin. Char-grill all remaining ingredients for 1-2 minutes each side, until cooked and marked by the grill. Place in another bowl, season to taste and toss with extra virgin olive oil and basil leaves, 1/3 cup picked basil leaves, plus extra for top. 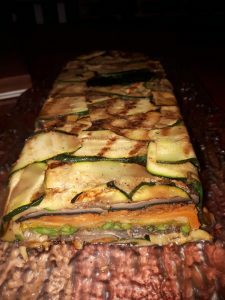 Layer strips of zucchini, overlapping slightly, across the base of the pan, with ends extending up the sides. Layer remaining vegetables and mushrooms in alternating colors with basil leaves, ending with eggplant. Pour any excess oil over and fold plastic wrap over vegetables to enclose. Weigh down with something I use bricks, but try cans. Place on a tray to collect the excess liquid from weighing the pate. Chill overnight. When ready to serve, upturn onto a platter. Carefully remove pan, then peel away the plastic wrap. Scatter top with basil leaves. Serve sliced, with Chimmichuri sauce (below). 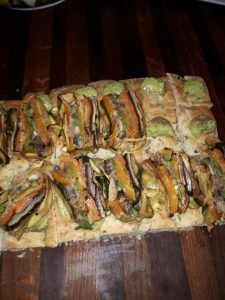 Slice the Focaccia, top with Guacamole, then Grilled Vegetable Pate. Use non-stick vegetable oil spray to lightly grease a 9″ x 13″ pan. Drizzle about 2 tablespoons olive oil atop the spray; the spray keeps the bread from sticking, while the olive oil gives the bottom crust great flavor and a bit of crunch. 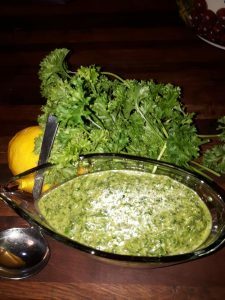 Combine all of the ingredients, except the herbs, and beat at high speed with an electric mixer for 60 seconds. 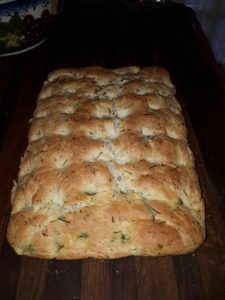 Drizzle it lightly with olive oil, and sprinkle with the fresh herbs of your choice. Bake the bread until it’s golden brown, 25 to 30 minutes. Slice the avocados in half, removed the pit and skin and place in a mixing bowl. Mash the avocado with a fork and make it as chunky or smooth as you’d like. 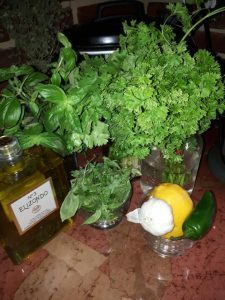 Combine oil, garlic, vinegar, salt, cumin, red pepper flakes, black pepper, cilantro, oregano, and parsley in a blender. Pulse blender 2 to 3 times; scrape down the sides using a rubber spatula. Repeat pulsing and scraping process until a thick sauce forms, about 12 times.